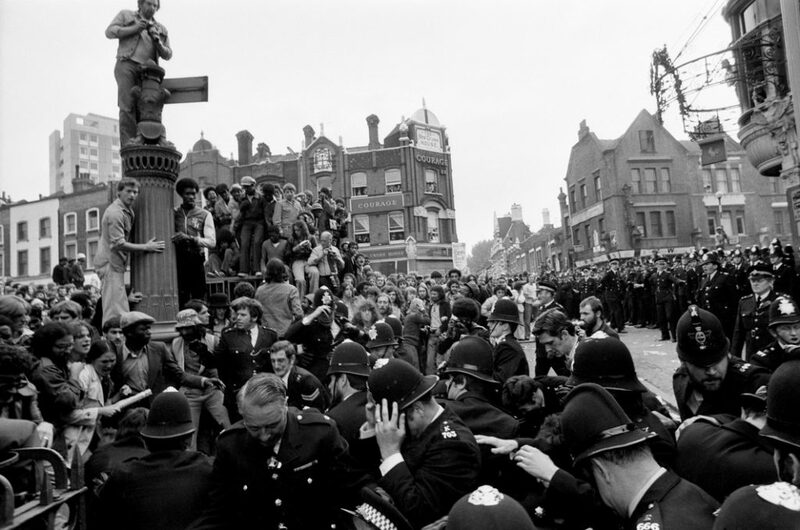 August this year sees the 40th anniversary of the demonstrations and clashes of the 'Battle of Lewisham' when thousands of people turned out to oppose a racist march from New Cross to Lewisham by the far right National Front. Goldsmiths is leading on a number of events to commemorate the 1977 protests which are recognised as a turning point in the fight against fascism at that time. Among the initiatives is the installation of a commemorative maroon plaque on New Cross Road. But how should the plaque be worded? You can have your say by voting on a number of suggestions or indeed coming up with your own idea before midnight, this Sunday 30th of April. I was involved in a similar commemoration on the 'Battle of Lewisham' 30th anniversary in 2007. This included a conference at Goldsmiths and a history walk which I helped lead and that included different perspectives from people who had been involved on the day. There were some great material produced and collected from all this - see the Lewisham 77 blog - and Goldsmiths historian John Price hopes to build on it for this August's events. Photo of police atempting to clear anti-racist protestors from Clifton Rise, 13 Aug. 1977 (© Peter Marlow) - in this photo you can see the New Cross House in the background and the corner of the New Cross Inn on the right. The protestors are clustered round what was then the public toilets on Clifton Rise.